Having more than 10-years experience working in the fitness industry as a trainer and coach, I know that many believe paying for personal training sessions is exclusively the preserve of unmotivated beginners. But what about the highly motivated beginner? Or advanced yet unmotivated gym goer? How about the powerlifting athlete keen to learn technique pointers, in search of an improved clean and press? Or the bodybuilder in need of expert help to optimise growth and recovery? What about the trainee that has a medical issue or a learning disability, but doesn’t want this to prevent a workout? Everyone can benefit from the guidance a trainer brings, no matter what your level of ability. Even experienced athletes can learn something new from another high-level athlete or trainer. After all, this is the beauty of the industry – there is no, one-size-fits-all approach, and we are all able to continually learn through our own experiences, peers and advancements in science. Allow me to take you through the main benefits paramount to personal training sessions, regardless of how experienced you are. Yes, yes, it’s a bit of a cliché – and I’m by no means a trainer that bounces around giving high fives and free hugs – but, if you’ve invested your hard-earned money for a good trainer, you’ll be more inclined to get down the gym, no matter how dark and depressing the weather is outside. We all have those days – when we return from work, sit down with a coffee and could quite happily doze in front of the television – but our fitness goals won’t get any closer if this keeps happening. If you know there’s a trainer at the gym waiting for you, it may keep you motivated for longer. Plus, if the thought process has been taken off your hands – or head – around things like diet, whether you’re improving and the suitability of a programme, this might clear your head to allow more focus on the session itself; safe in the knowledge you’re being supported by a professional. I have so many people tell me they often go to the gym with good intentions, but don’t really know what to do or how to do it, and ultimately become demotivated and leave – thus not adhering to a fitness plan and not achieving the results they crave. A personal trainer or a professional tailored programme is custom-built for such a scenario. How many people do you know with a rotator cuff injury or a sore lower back as a result of the gym? All of this may have been avoided if the trainee had sought some advice either prior to exercise, when it started to niggle, or had a PT assess their form. Many don’t like asking for advice in gym environments, but please take advantage. Yes, trainers can vary in ability, but should you approach a trainer you trust or that comes recommended, this may prevent injury or progress your training to entirely new levels. To test exactly how effective the guidance of a personal trainer can be, try performing a session on your own, then complete the same routine the following week with a PT. Irrespective of how hard you think you trained first time around, you’ll no doubt experience a whole new level of intensity. Why? Because we all push ourselves that little bit harder when competing with or being motivated by someone else. It’s more mental than it is physical, and can improve performance by anything up to 50%. You only need log on to Instagram to see that, these days, everyone is a coach or trainer – or at least they claim to be. They’ll even offer an exercise programme, yours for a single, small, standalone payment. But just because someone looks good in a pair of Speedos, it does not necessarily mean they know how to get you results. If you are looking for a trainer or coach, I would strongly advise you scour the web and the local area for a professional with experience and proven track record. Sure, they might have a great physique, but they should also be able to provide a long list of successful clients and/or reviews, to back it up. To sign off, I’d just like to share with you a recent client of mine. 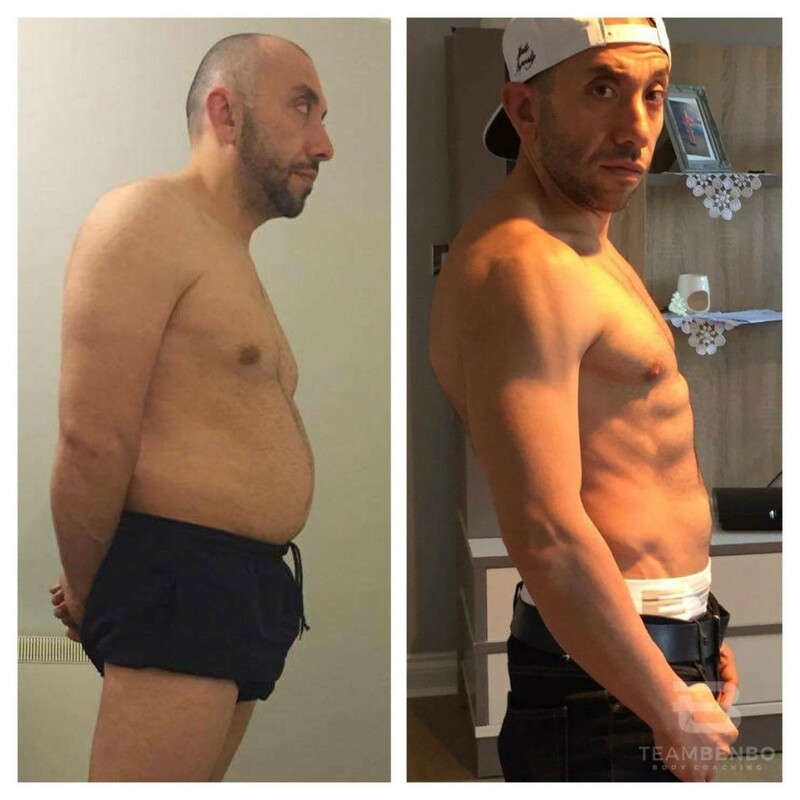 A father to young children and small business owner, Erhan’s goal was to change his body composition, but he found going to the gym alone a struggle at times. Motivation for weight training was low, and working long hours meant his diet was an issue and he often craved sugar. With a busy family lifestyle, Erhan found it difficult to deviate from family plans or meals to pursue with his fitness goals, and relapsed from online coaching three times due to other commitments. Ultimately, his determination prevailed and we worked together for five months on and off, with the initial four months online coaching, with four weeks of personal training to finish. The results speak for themselves – and of course, Erhan was powered by BULK POWDERS® nutrition throughout. PT and coaching has a wide spectrum of benefits for all levels, so long as you do your research. Fitness is not binary – it is slightly different for each individual – so whether you prefer to train alone, with a partner or a qualified instructor, just be sure to keep progressing towards your goals. Ben Rowe is the Lead Coach at Team Benbo Body Coaching. Team Benbo have over 10 years of experience in the fitness industry, sharing their in-depth knowledge around Sports Specific Training, Nutrition, Online Coaching and Competition Preparation.